Okay, everyone’s been here before so let’s make it brief. What happens if you go back in time and kill your own grandfather before your own conception? Brainspasm! Paradox! Universe stops you! Alternate reality created! Quantum ! So far, so good – we’re all aware of the stock answers from the plethora of time travel tales floating around the spacetime continuum. But what happens if you, in the middle of a typically depressing day, kill your own future who is self trying to warn you of something vatially important, thus sealing your own inevitable doom at your own (past? present? future?) hands? Ha, now you’re stuck! 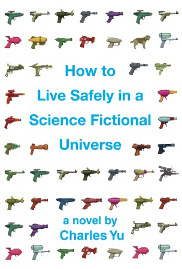 Charles Yu’s How To Live Safely In A Science Fictional Universe is a wondrous and utterly original take on one of sci-fi’s most famous and enduring themes. Part biography and part mind-melting paradox party it spins the yarn of Charles Yu (yup, the same) as he endures the tedium of his day job – chronoverse-roaming time machine repairman. Charles spends his days tracking down those who have mischievously stepped too close to creating a paradox, rescuing their flailing vessels and sending them back to reality with a smile and a warning. Those wrestling with the fabric of reality risk ruining the game for the rest of us and Charles is tasked with ensuring that doesn’t happen. Sounds fairly exciting but as with any job it lapses into routine and loses its heroic lustre. Charles is thoroughly locked into the daily grind, sharing his desolate life with only his dog and his AI pilot (with who he may or may not be in love) to keep him company. His mother spends her days willingly trapped in a time loop, forever reliving the happiest afternoon of her life a vignette of dreary suburban existence) with occasional intercessions from her son. And his father? Well there’s a problem. His father vanished long ago, disappearing into the quantum absurdity of the science fictional universe which he was instrumental in creating. It’s during one of these humdrum days – repairs, maternal visits, paternal searching – when Charles instinctively and fatally shoots his future self in the stomach. Future Charles has enough time to gasp a few words of warning before expiring, while present Charles rockets off in his ship to his self-inflicted fate. This is the superficial guise of How To Live Safely In A Science Fictional Universe, but the reality is far deeper and far more rewarding that the mere plot may suggest. For starters, Charles Yu’s writing can be both achingly beautiful and surprisingly brave. He has a love of words which seems to result in a kind of over-protective obsession. Once he begins a sentence he seems almost afraid to let it end. Sometimes a single linguistic construction will flow on for page after page, growing in complexity and content until it wants to explode. Rumour has it that sentences occasionally graze the 250-word mark – I never counted. Rather than feeling clumsy and convoluted, these thought-streams dance across the page with a natural grace, looping back and forth with an effortless beauty. At other times there is a stark and almost spartan feel to his prose, especially when detailing the father-son relationship which is central to the story. The sudden empty feeling of these passages echo the growing distance between the two and provide a jarring contrast to the opulent descriptive narrative of the time travel sequences. It is here that we uncover the true meaning of How To Live Safely In A Science Fictional Universe, that all of Charles’s ricocheting around the multiverse is a warning. He views his life forwards, backwards, from up close and afar but during his viewing he forgets the most important thing – to participate. Like too many of us, Charles has become untethered from reality and is watching his days slip past him until they are nothing but action replays. Even if symbolism isn’t your bag I can’t recommend How To Live Safely In A Science Fictional Universe strongly enough. The time travel story floating on the surface is one of precious few original takes on that honoured theme in circulation these days. The deeper story lurking just under the surface is enough to have you putting the book down regularly and losing yourself in your thoughts for a while. The prose will make aspiring writers spew envious bile over every page and have appreciative readers fall in love with Mr Yu after every chapter. Hell, even the title alone is worth the price of admission.